At my parents' place we used to eat a lot of roasts beef until fish took over for healthier reasons. As my parents would say, the only person not really happy about our new healthier diet, was the butcher! And yet, my parents were not his best customers : there were people going to the butcher on Sunday morning and ordering meat for the whole week. More than we would be eating in a month! We don't cook Sunday lunches in Philadelphia. If we have time, we'll cook some fish fillets with a side of rice and vegetables (eg: Tilapia with Ratatouille and rice). But most Sundays, we just have leftovers. I therefore tend to cook nicer dishes on Saturday, especially if we have friends over for dinner... or during the week depending on my schedule and laziness menus. I was not planning on cooking Boeuf Bourguignon this week (we had some early December and we don't eat much beef) but my sister who lives is Asia is having a dinner party this Saturday. As we were exchanging ideas of a main course she could make considering her constraints (time, equipment, ingredients), she mentioned Boeuf Bourguignon. Since I had not posted a recipe for Boeuf Bourguignon yet, I told her that I was going to cook it for her so that she could get the recipe and the picture before Friday evening (that's Saturday in Asia). I serve Boeuf Bourguignon over pasta (egg noodles or fettuccine) while some other people would serve it over steamed potatoes. Your choice. 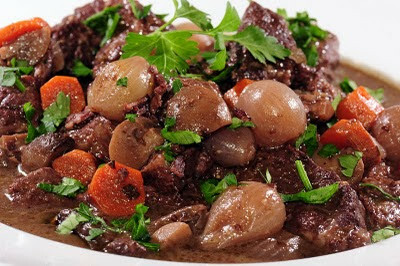 One thing I like best about Boeuf Bourguignon is that, once on the stove, you can forget about it for hours (I like to cook it for 2 or 3 hours but does not cook the mushrooms at the last minute like Julia Child!!). Just come by the kitchen every now and then to stir it but that's it! Besides, it's a total success with my children who enjoy every fork/spoon of it.... and to top it all, it makes really great leftovers. Think about it : a Saturday dish that makes your Sunday lunch even nicer! Deux pour le prix d'un! Bon Appétit! In a Dutch oven (or thick-bottom pot with lid), heat olive oil. Divide the meat in two or three batches, salt the meat and brown the meat cubes for 3-5 minutes. Repeat with each batch. Reserve the meat. Cook the bacon pieces, stirring constantly because by now the bottom of your pot should look brown to you!! Add the onions and carrots. Pour a little bit of wine, don't be afraid if it bubbles and déglace the pot with a wooden spatula/spoon (scratching the bottom of the pot: all the brown pieces should come out). Add the meat, the bouquet garni, pepper and mushrooms. Barely cover with red wine (ie, there should be just enough wine to cover the meat/veggies: you don't want them to swim in wine). Add one tablespoon of Dijon Mustard and stir. Serve over steamed potatoes or pasta. Start by browning the meat; you can cut the veggies while you brown the meat. If you don't have pearl onions, you can use regular onions (not sweet): don't slice them, just cut them into quarters/eigths. I had this at Gaelle's house with her two lovely children and husband and it was absolutely the best boeuf bourguignon I've ever had. All balanced flavors and I would say that the pearl onions are part of what make the dish. So look for them! Yum. Your boeuf bourguignon looks absolutely fantastic! Reminds me of my B-day trip to burgundy last summer! Great to see a French mom in the US cook some really awesome french food! Especially cause I'm almost exactly the contrary: the wife of a truly american guy making american food in Paris! I just watched Julie & Julia this weekend and her recipe for this dish seems a bit complicated. So happy to find your recipe (and this blog)! Looks like next weekend's meal :) Thanks! I did it! Last saturday and it was very good and easy! I can not find pearl onions in Shanghai but it was ok and tasty with big white onions. Two people have already asked me for the recipe hehe! You have to post your recipe for the "entree" (salade verte avec tomates+ pignons + aneth +vinaigrette a la moutarde (of course)). It was great and easy to do. Thank you a lot for your help sister! I tried it with grape juice, since I didn't have any wine on hand (and probably never will). I would suggest if anyone else tries this that they use vinegar or lemon juice for part of the liquid. It was overly sweet BUT the meat part was fantastic!